The title of this post was taken from the LDS Primary Song Love is Spoken Here. I'd like to share the words to the first verse. I don't talk about my religion on here because its deep and personal to me. However, today I feel the need to share a few things. I am a member of The Church of Jesus Christ of Latter Day Saints, commonly known as the Mormon Church. I have been a member my entire life, but I haven't always believed what I was taught. There were many years when I choose to live my life in ways that left me lacking. It wasn't until I was older and able to truly figure things out for myself that I realized what had been missing from my life. Once I got back into church Mike was always supportive of the fact I wanted the kids to come to church with me. Mike considered himself agnostic and on rare occasions he would accompany us to church. He took the missionary discussions many times and enjoyed having the missionaries over for dinner or to talk, but he always found reasons to not take church seriously. I never pushed the church at him I was okay as long as he supported my desire to attend. In 2010 something changed. The missionaries were over one day and asked if they could teach him the discussions. I must admit that my head hung a little because I was tired of having the same conversation with them. To my surprise though Mike said yes. After that I would find him reading The Book of Mormon late at night or early in the morning after he got off work. He would write down question after question for the missionaries to answer. Mike still struggled in different areas of his life, but I could see his desire to be happy and to change things in his life that were bringing him down. From left to right in the back is my dad next to him is one of the missionaries that taught Mike, then Mike and myself with my mom beside me. In the front row is Sebastian then Tyler, another missionary and Mason. Things weren't magically easier after he joined the church. Our marriage still needed a lot of work, but I had faith that things were and could be better. We were moving in the right direction and we were happy. 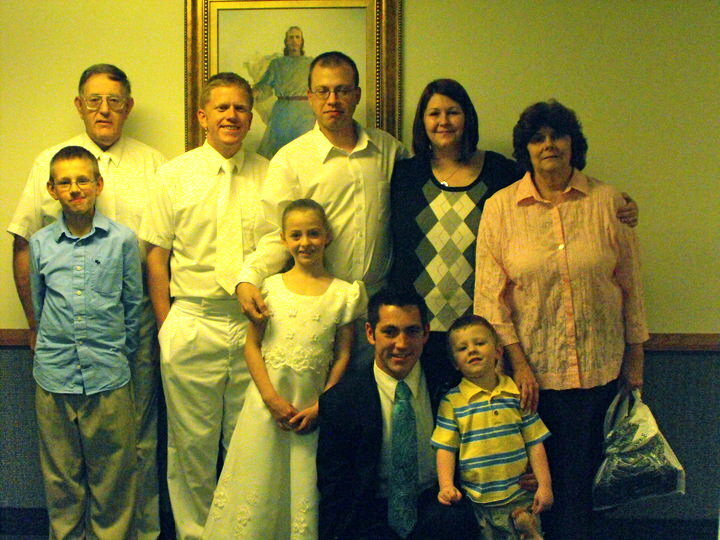 Mike passed away April 14, 2011, just shy of being a member of the church a year. There have been many tests of my faith since that day. I spent many nights on my knees begging my Heavenly Father for answers. Many of my prayers have been answered...and knowing that I will see Mike again someday helps me deal with the loneliness of today. I want to share one more thing with you. This is a talk given by Joseph B. Wirthlin during the October 2008 General Conference. After Mike passed I would listen to this talk over and over again, it brought me comfort. "When President Hinckley spoke at Sister Wirthlin’s funeral, he said that it is a devastating, consuming thing to lose someone you love. It gnaws at your soul. In the lonely hours I have spent a great deal of time thinking about eternal things. I have contemplated the comforting doctrines of eternal life."